I have had a YouInvest (formerly Sippdeal) SIPP (Self Invested Personal Pension) wrapper since 2011. It came about when I first started transferring expensive insurance company based Stakeholder and Group Personal Pensions across to SIPP’s to save on expenses. Over the years this SIPP has grown steadily to become a significant portion of my wealth as it now contains circa £200,000. The iShares European Property Yield UCITS (IPRP) with annual expenses of 0.4%. A YouInvest SIPP custody charge (Shares inc. investment trusts, ETFs, gilts and bonds) of 0.25% per annum but which is capped at £25 per quarter. A YouInvest SIPP custody charge (Funds inc. unit trusts, OEICs and structured products) of 0.25% per annum for the first £250,000 but which important is not capped. This was the critical change that affected me greatly. 2% remains via 258 companies. 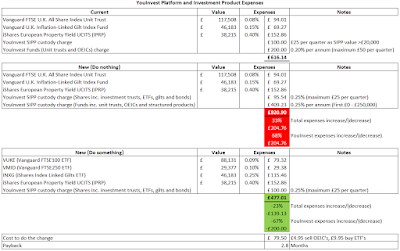 25% VMID (Vanguard FTSE250 ETF) with annual expenses of 0.10%. I also sold my Vanguard U.K. Inflation-Linked Gilt Index Fund and replaced it with INXG (iShares Index Linked Gilts ETF) which unfortunately carries annual expenses of 0.25%. The end result was that instead of my wrapper and product expenses going up by £205 per annum I was able to reduce them by £139. Total time invested was about 2 hours. I’ll also add that to reduce market moving while I was out of the market risk I completed the shift in 2 tranches a few days apart. Total cost to complete the move was £79.50 which will pay for itself in about 2.8 months. The end result on my total wealth is that total expenses have reduced from 0.254% per annum to now stand at 0.243% meaning I am still paying some £2,559 per annum in product/wrapper expenses. Much better than some but hopefully with time more opportunities will open up to further reduce. They are very similar to HL with their new charging structure and it certainly encourages ETFs instead of funds. I reckon the payback period will be higher as there are bid-offer spreads to factor in (0.17% on INXG, 0.05% VUKE, 0.21% VMID). Keeping buying and selling to minimum also keeps charges low. Two very good points. I paid no bid-offer spreads on the OEIC's but certainly saw a spread on the ETF's. - a VOD sale in Jan 2014 just before the Verizon sale. Then I have to go back to Aug 2011 which was a gold sale which was a forced mechanical rebalance as I'd become overweight in gold. Much lower turnover than most actively managed funds. You must be very disciplined to ignore all the noise. Boring investors are the best! It's been one of the pillars of my investing strategy. Go mechanical with preset rebalancing bands then go fishing. Why did you buy an ILG ETF with annual expenses of 0.25% instead of just buying a single suitable ILG? Do you (or do any readers) buy gilts/ILG's directly in your ISA's or SIPP's? If yes, would love to know a little more. Buy/sell spreads, availability, liquidity.... Also, what's the process? Just like a share? Why are you working out the £values of the expense charges for the funds and ETF's? You're not being charged by AJBell to pay those, aren't you? These charges are being settled by the fund or ETF in question out of the dividends/income they receive/make over time, as far as I understand it. 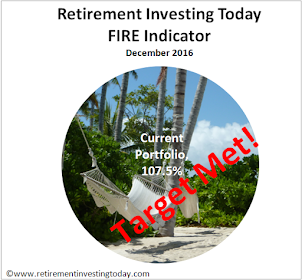 I had exactly the same email and drawn the same conclusion - ETF's, investment trusts and individual shares it is! Need to find another SIPP for holding funds though. I do this as I'm always interested in the total expenses = product costs + platform costs. 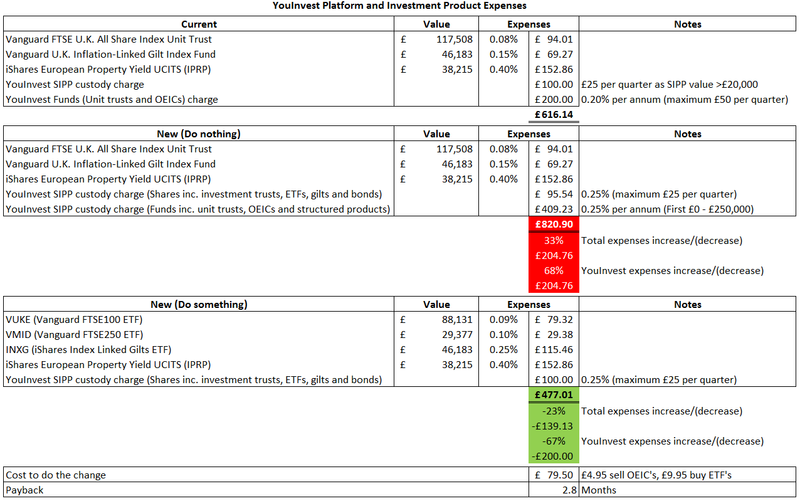 In this example you can see that I save on the platform costs but I do have to pay more for the ETF's vs the OEIC's. In total it was a reasonable cost saving so I went for it. Hope that makes sense? Re a SIPP for OEIC's. To hopefully speed that up for you are you aware of the excellent Monevator Compare Brokers tool. Personally, I now no longer hold any OEIC's in UK low cost broker accounts (Trading, ISA or SIPP). Full disclosure: I still do have funds with my work pension and held directly with Australian providers - Vanguard and Perpetual (a mistake that I've written about before). This is another advantage of holding assets in an ISA - what happens to those assets on death. Sorry - it looks like the above is not going to work as a direct link - but I think this one will.Otherwise just google subject yourself. This benefit of ISA transfer on death is significant - especially if the portfolio is large . No CGT is payable on death - but under the "old " system the assets held in the deceased's ISA would immediately lose their ISA wrapper and then start accumulating potential capital gains- and the income becomes taxable. Now - the next change to ISA's that we can all dream about is that HMG make them completely tax free ie free of ALL taxes - and discount assets held in an ISA from IHT ! It might happen - but unlikely. As regards ILG's - they are free of CGT if purchased as an individual gilt - but not gilt funds. This may be helpful and of interest. 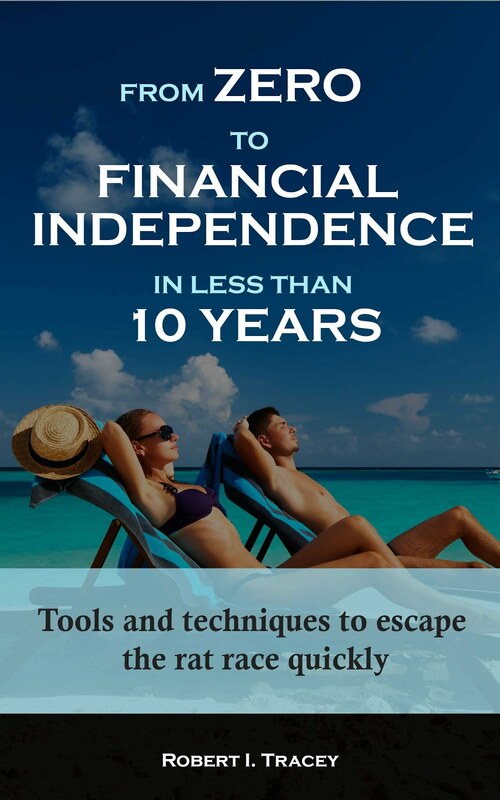 Relates to which assets to hold in your ISA and SIPP to benefit most from taxation quirks. The point about the size of the total ISA holding is clearly very relevant. The article suggests that AIM shares might be best placed in a SIPP - but NB AIM shares held in an ISA for at least 2 years become free of IHT. So - you could end up with an IHT free ISA - but you would need to accept the extra risks of holding some AIM shares in your portfolio. I am not sure if- when you sell an AIM share held in an ISA after 2 years - you have to re-invest the proceeds in another AIM share to preserve the IHT benefit - or whether the proceeds are somehow " cleansed " of IHT and you can re-invest in anything you choose. Thanks for this stringvest. It nicely demonstrates the complexity (unnecessarily so IMHO) and craziness of our tax system. You really should not have to read for many hours or pay for taxation advice. Taxation is a necessary evil and our faithful leaders should focus on simplicity to leave us maximum time for entrepreneurship and pursuits that give us wellbeing but I'm moving off topic so I'll stop now. Nice work vicarage. Why don't you do a partial transfer to HL now though? Gives you the low expenses now and by transferring multiple times you minimise market move risks while the transfer/s is in progress. I'm doing exactly this and it seems to be working ok with no downsides that I can see. Ahh now I understand. Thanks for clarifying. Are you FIRE'ing or moving on to another work opportunity? I hate my job, am bored with the field, am not prepared to commute or relocate due to caring commitments, and have enough cash, so it may well be FIRE. We'll see how pottering around goes. I'm 4 years older than you, richer and with less earning potential. I've not enjoyed a range of jobs for the last 15 years, so suspect its me, not them. I moved back in with my housebound mum in outer London. We get on, she pays all the bills, and I can still go on nearby holidays, so that's working out well, but I hated a dull remote working test job I took on 4 years ago, as it meant all my interaction with colleagues was negative "you have forgotten to...", but my options are limited as my IT skills are dating. I want to do a range of different things, especially things outdoors and involving exercise, so gardening when its sunny, internet in the rain. My one-more-day concern about finances has always been because of the uncertainty over mum's lifespan, when I might get an inheritance that would boost my finances by 50% or require my contribution to care home fees. And I want to travel the world, up to 6 months a year, which is very hard to budget when the time window to do it could be 10 years or 40. But I got up fed up living a lie at work, so I'm off, to potter for a bit. Many thanks for the added detail vicarage. Wishing you much success with it all. So I could see someone easily being able to halve expenses. Of course probably not so good for small portfolio's as trading costs would probably start to have an impact in costs. I just calculated the cost of various holdings in £ rather than % and it has renewed my commitment to cutting costs. Property is the worst. REITs all charge ~1.2%. If everyone has to pay this, must the returns on property be commensurately higher to satisfy the EMH? Also, do REIT etfs have the expense ratio of the underlyings baked into their own? I believe UCITs compliant funds are not allowed multiple layers of fees. Finally, beware YouInvest investors, of the FX charge. A whopping 1% (so 2% once you've sold). Totally disproportionate to the cost on the exchange (about 1% of 1%). So never buy foreign currency items. Well done on flipping the problem round. I had a peek at the numbers and saw you have your UK exposure split between FTSE 100 and FTSE 250, with 3x the amount in FTSE 100 vs FTSE 250. Are you 3x more confident in the FTSE 100 vs FTSE 250? If you don't have a strong view, have perhaps you might allocate 50/50 instead? No, not more confident in the FTSE 100 vs FTSE 250. I've proven previously my crystal ball is very firmly broken. I was simply trying to replicate the FTSE All Share as closely as possibly using only low expense ETF's. I suppose the point is that you are by default (based on the All Share) placing 3 times more emphasis on the FTSE 100 vs FTSE 250. But you don't think the FTSE 100 is better than the FTSE 250, so why the higher weight? Just because the All Share has that weight doesn't necessarily make it logical to replicate it. You have an HL SIPP as well right? what do you keep in that one? Total value is about £200k meaning I'm seeing total annual HL costs (ETF's obviously extra) of £200. I face a similar large increase in my Youinvest Sipp fees for holding Vanguard funds. Can anybody let me know how I can identify Vanguard funds on the Youinvest platform are classified as ETF's and therefore avoid the 0.25% charge ? Alternatively the Ishares core funds look to be another option. I have stayed solely with ITs and ETFs ever since getting an AJBell SIPP, being wary of the fund charges. I was holding XBUI ETF linkers recently (0.20% annual expenses) and then they delisted with a forced sale! Will be buying INXG at the next regular savings day. They have all increased rather suddenly recently. Looking at the performance figures on the Vanguard website: FTSE Developed Europe ex-UK Index Fund (VDEXEIA) significantly outperforms its ETF equivalent (VERX). Am I missing something?